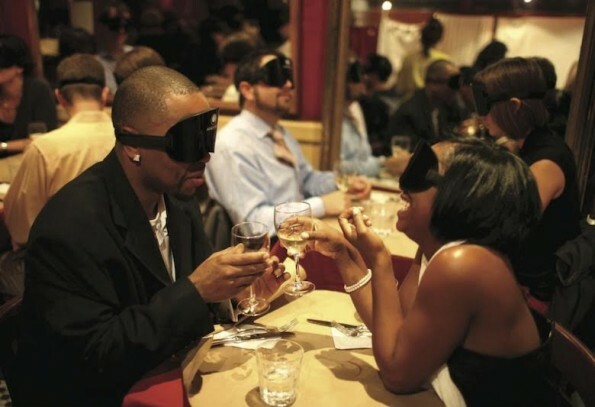 Get your blindfolds ready for Dining in the Dark, hosted by Crust Chandler on April 26, 2016 at 7 p.m. to benefit the Arizona Center for the Blind and Visually Impaired. Relying solely on your sense of taste, smell and sound, Dining in the Dark offers a unique awareness experience where guests will taste their way through a sensational four-course wine pairing dinner. Wine notes: exploding with flavor! Intense and vividly focused, with plenty of fruit and herb flavors. Wine notes: opens with an inviting tropical fruit-like bouquet and aromas of kiwi, banana, and summer stone fruits (apricot and white peach) A slight hint of toasted oak on the finish. Wine notes: medium bodied, the wine shows flavors of dark raspberry, spiced plum and integrated toasty oak notes. Proceeds from Dining in the Dark will benefit Arizona Center for the Blind and Visually Impaired (ACBVI). ACBVI is committed to enhancing the quality of life for individuals who are blind or visually impaired. Operating out of central Phoenix, ACBVI offers services including technology centers, social recreation, support services and rehab training for adults who are legally blind or visually impaired as well as those who have a degenerative eye condition which may eventually become a visual impairment. Tickets for Dining in the Dark are $65++ per person. Reservations are required and space is limited. 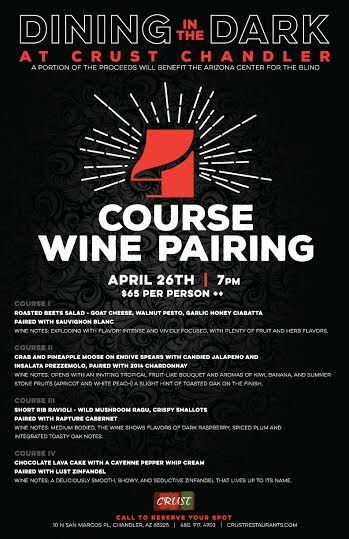 Call Crust Chandler to reserve your spot today at 480-917-4903. Crust Chandler is located at 10 N San Marcos Place, Chandler, AZ 85225. Today, Crust Restaurants include three full service locations in Scottsdale, Phoenix and Chandler. Crust Restaurants also operates a satellite locations in the Phoenix Convention Center as well as a sister concept, My Pie – with two locations in Phoenix and Tempe. Visit Crust online at www.CrustRestaurants.com for more information and to view their complete menu.